Arthritis by definition is loss of the articular cartilage that covers the ends of the bone that make up different joints in your body. The knee is one of the largest joints in the body. Arthritis is caused by the natural aging process, morbid obesity, genetics and trauma. When non operative or conversation treatment has been tried and failed the next option is surgical intervention. The knee is made up of 3 compartments. A total knee replacement is when all three compartments become replaced or resurfaced. A uni-compartment knee replacement is performed when only one of the three compartments are replaced. The most minimally invasive surgical treatment for knee arthritis is a knee arthroscopy. This has fairly narrow indications. 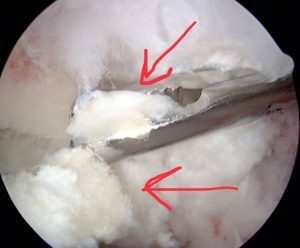 In some cases of knee arthritis when pieces of cartilage break off it can cause mechanical symptoms such as catching and locking. It can be extremely painful when the knee locks, catches or pops. If this is the situation a knee arthroscopy is indicated. The knee scope is completed to remove the loose or unstable pieces of articular cartilage. This is a pretty quick surgical procedure that takes about 15 minutes to complete. It does require a general anesthesia and the patient does go complete asleep for the procedure. There is typically not much pain associated with it and a quick recovery is standard. Usually within 10-14 days return to normal activity is achieved. The knee arthroscopy done in a patient for knee arthritis will not improve range of motion, stiffness, straighten out the angled leg or regenerate new cartilage. The scope is performed to get rid of mechanical symptoms. The red arrows in the following image point to loose cartilage.